Each and every year the crowds get bigger, we reach more families, and we raise more money to help our city. Tickets for the award-winning Midnight Circus in the Parks, which begins its 12th anniversary tour the weekend of August 25th and 26th in Garfield Park, are now on sale at http://www.MidnightCircus.net. The all-new Chicago production features favorite performers from previous years and some spectacular new acts that have never been seen under the “magical” Little Big Top that will travel around the city for nine consecutive weekends with one goal – “to create community and rebuild parks, one circus at a time!” Due to popular demand, founders Jeff and Julie Jenkins have extended the tour this season, adding new parks and more Friday night shows along the way. This year, Midnight Circus plans to entertain record crowds of 15,000-plus. To date, the program has raised nearly $1 million for park improvements in Chicago. As parents, artists, community activists and life-long Chicagoans, Jeff and Julie believe that public parks “are part of the foundation upon which a great city is built.” Midnight Circus enjoys a fantastic reputation in the world-wide circus community and attracts top-tier talent from around the globe. The new show consists of a large contingent of performers from places like France, Canada, Australia and of course, Chicago – including performers who recently captured awards at the prestigious Cirque de Demain Festival in Paris, France. 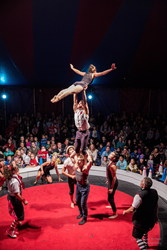 Midnight Circus 2018 combines amazing acrobatics, heartfelt storytelling, live music, dance, and even rescued canines and more under the Little Big Top where there is no such thing as a bad seat. A testament to the incredible quality of the show is the fact that Midnight Circus is the only American circus to play the world-renown Montreal Circus Festival. Each 2 hour-show takes place under the intimate, Little Big Top tent where kids can get within an arm’s length of the action. Tickets: On sale through http://www.midnightcircus.net. Price is $5 to $22, with no charge for children under two. Discounts are available for groups of 25 or more. For more information, visit the website.